Christians across Scotland are uniting for The StAnd: a year of prayer leading up to the Independence Referendum in September 2014. 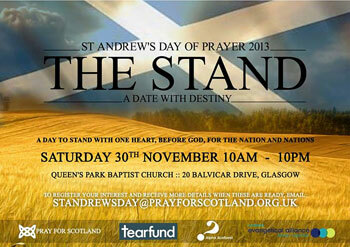 The year of prayer will be launched at a 12-hour worship and prayer event on St Andrew's Day, 30 November 2014 in Queen's Park Baptist Church, Glasgow. The initiative was inspired by 100 years of prayer undertaken by the Moravian Church in 18th century Germany in a small village called Herrnhut. "We can’t replicate the move of God experienced by the Moravians, but we can take time – take a StAnd together – to seek Him in prayer and fasting, in worship and repentance,” says Lynne Paterson, Tearfund Scotland Director. “We trust that as we do our part, God will also do his." The Christians in Herrnhut committed to regular watches of prayer round the clock. Similarly, The StAnd will encourage churches, families, groups and individuals to sign up to pray for an hour each week for God's kingdom to come and his will to be done in Scotland throughout 2014. The StAnd prayer initiative is organised by a coalition of church leaders and Christian organisations in Scotland including the Evangelical Alliance, Tearfund, Alpha Scotland, Pray for Scotland and Glasgow House of Prayer. They acknowledge that Scotland faces one of its most important years in its history, and point out that this year’s St Andrew’s Day of prayer became a vision for more than a day. As well as the referendum, another important date for Scotland next year is the Commonwealth Games. The StAnd will be praying for the sporting events, supporting churches that will be reaching out to visitors attending the games in Glasgow over the summer. This prayer event takes its biblical reference from the second Book of Chronicles. Chapter 7, verse 14 says: "If my people, who are called by my name, will humble themselves and pray and seek my face and turn from their wicked ways, then I will hear from heaven, and I will forgive their sin and will heal their land."